From the outside, you might think that Donald W. Reynolds Stadium is the home to a professional team from the NFL or perhaps pro baseball team, but you would be wrong. 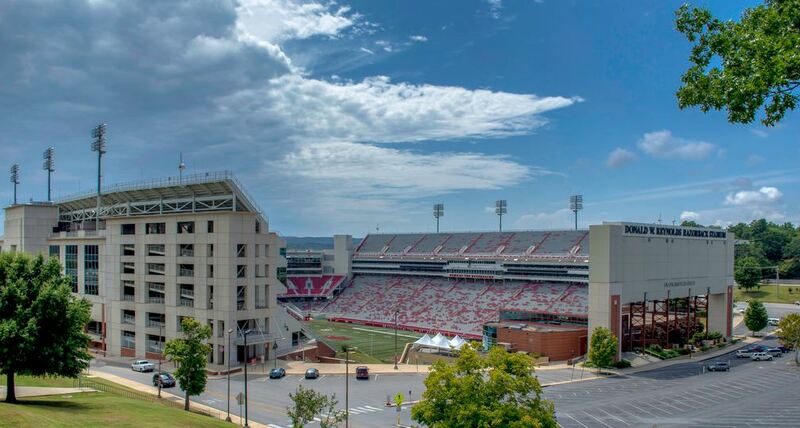 On any given Saturday during the Fall, the loud roars that billows from this stadium belong to the 72,000 fans that pack Razorback Stadium to watch the University of Arkansas football team. Razorback Stadium is encased in brick and glass that gives it a very modern look often associated with the newest stadiums of the NFL and MLB. These improvements, along with others, were thanks to a $110 million renovation project that was completed prior to the 2001 season. The eastern concourse of the stadium includes a section that displays every conference championship banner as well featuring a tribute to the university’s national championship in 1964, the western concourse features a tribute to every bowl game Arkansas has participated in and the south concourse features every Razorback All-American. Included in the renovation project were the addition of luxury suites, an expanded press box and perhaps the most impressive addition was the video screen above the north end zone, that today measures 38 feet high by 167 feet wide. Originally built in the 1930s, the stadium’s original capacity was a mere 13,500, almost one-fifth its current size when the Razorbacks played their first game on September 24, 1938 against Oklahoma A&M. It was known as University Stadium, then Bailey Stadium after Arkansas Governor Carl Bailey before being renamed Razorback Stadium in 1941. The Razorbacks have produced an impressive 129-62-2 (.674) record and hope to continue their winning ways into the future. In 2011 the university announced plans to potentially expand Razorback Stadium, adding seating in the north endzone. As of 2013, this project has not moved forward.